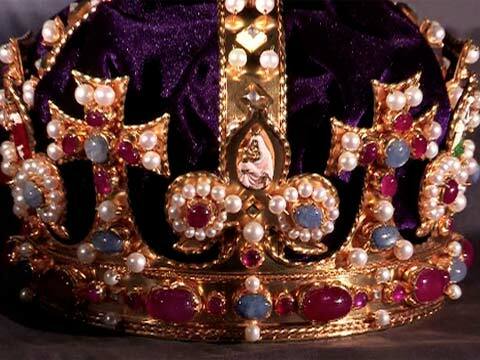 The lost crown of Henry VIII has been recreated in minute detail, down to the last pearl and thumbnail-sized enamelled sculpture, almost 400 years after the original was melted down along with every scrap of royal regalia Cromwell’s government could lay its hands on. The crown will be exhibited at Hampton Court Palace, where Henry wore the original on great occasions of state and church. It will be displayed in the royal pew of the Chapel Royal, which reopens this month after seven years of restoration work. The crown may have been made for Henry’s father, Henry VII, and was used in the coronations of his children Edward, Mary and Elizabeth, and then of James I and Charles I. By then it was a sacred object: a portrait by Daniel Mytens in 1631 – now in the National Portrait Gallery, and crucial evidence for the historians who pored over every surviving image and account – shows Charles I standing bare-headed by a velvet-draped table, on which the crown is shown in scrupulous detail. In 1649 Charles was beheaded in Whitehall and the crown was broken up at the Tower of London. The gold went straight to the mint for coinage, and the jewels were sold off in mixed packets like loose sweets. Of the heap of centuries-old treasures, only one 12th-century spoon escaped the melting pot.